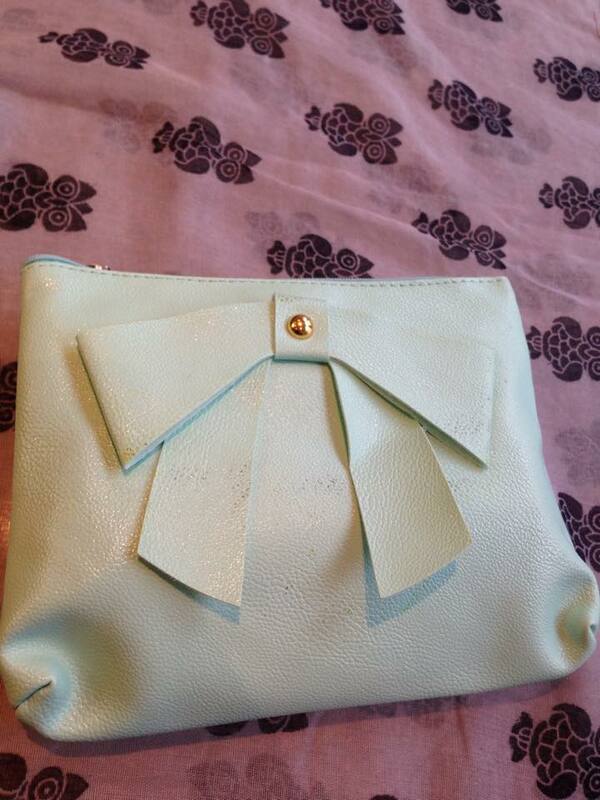 It’s that time of the month again and my August Beauteque bag has arrived! I unsubscribed from them last month, but couldn’t resist signing back up again. It’s the only Asian Skincare/Beauty subscription box, as far as I know, which ships to London and I love surprises so had to give it another go. So let’s find out if I made the right decision. The above was this month’s bag which all the products came in. It’s a nice size, but to be honest slightly cheap looking for my own tastes. 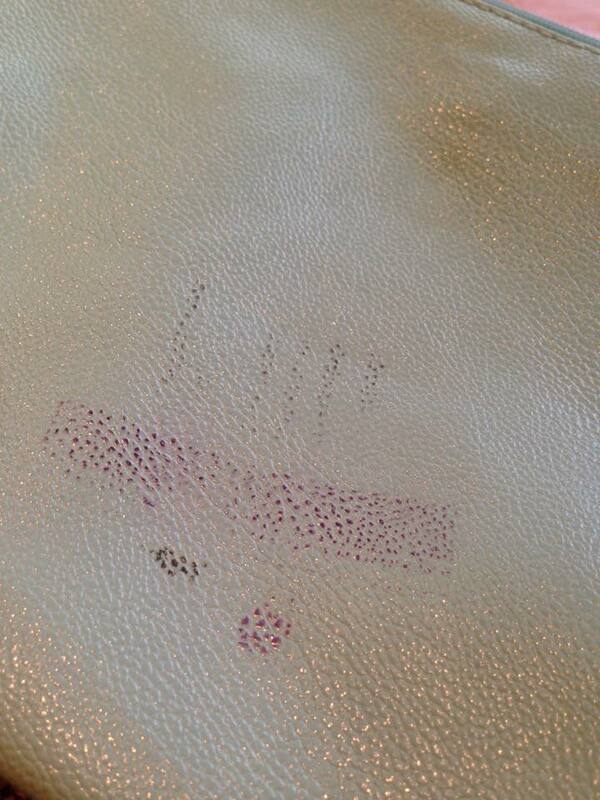 My bag arrived with some marks on it (as shown below), which required a good wipe with some baby wipes. Fortunately I don’t subscribe for the bag, otherwise this would be very disappointing. I was quite excited at first to see this in the bag. 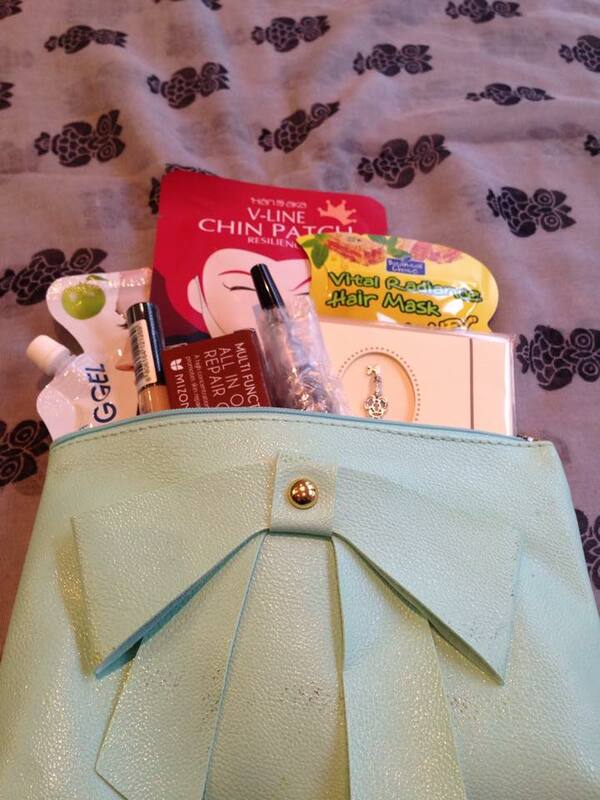 Beauteque is usually more skincare heavy so it was nice to receive this make up in the bag. 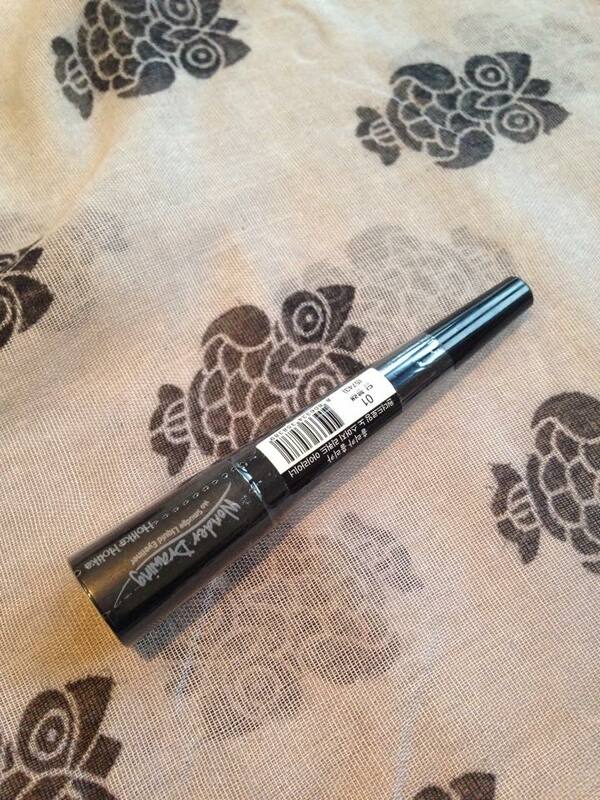 Holika Holika is a brand I’m familiar with, and I had yet to try their eyeliner! 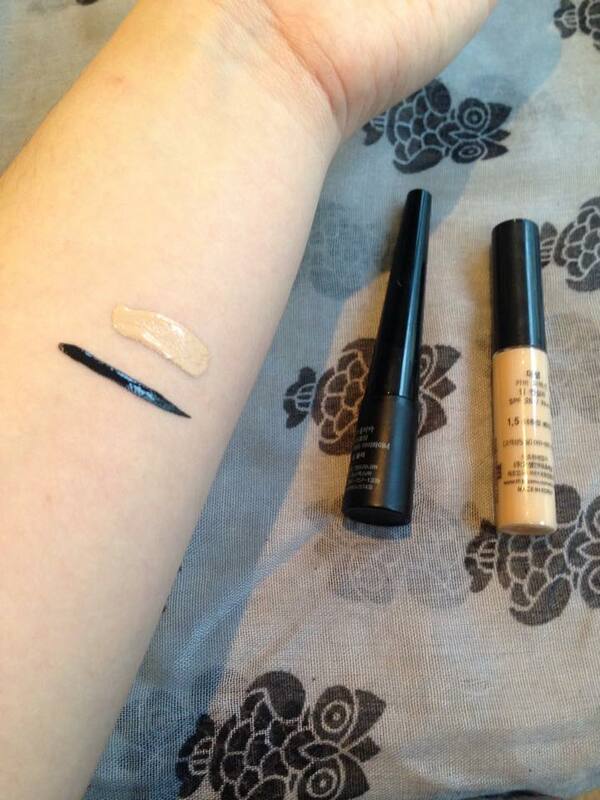 It applied really smoothly in my swatch, and came out a nice dark colour. However it took a while to dry, after three minutes it was still wet and I smudged it slightly. Also I would doubt its long lasting abilities given that I managed to wash it off relatively easily with some water and a couple of scrubs with a sponge. The value as well is rather inflated given that I found it on Korea Depart for a third of the price, though this does not include shipping and I even found it on amazon for half the price. There is also a pen version. 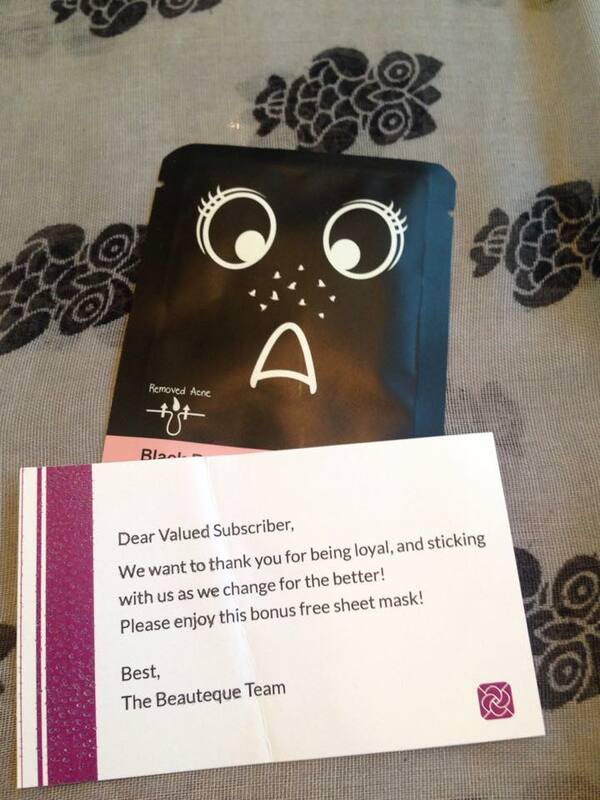 Beauteque always includes masks in their bbag and this month was no exception. 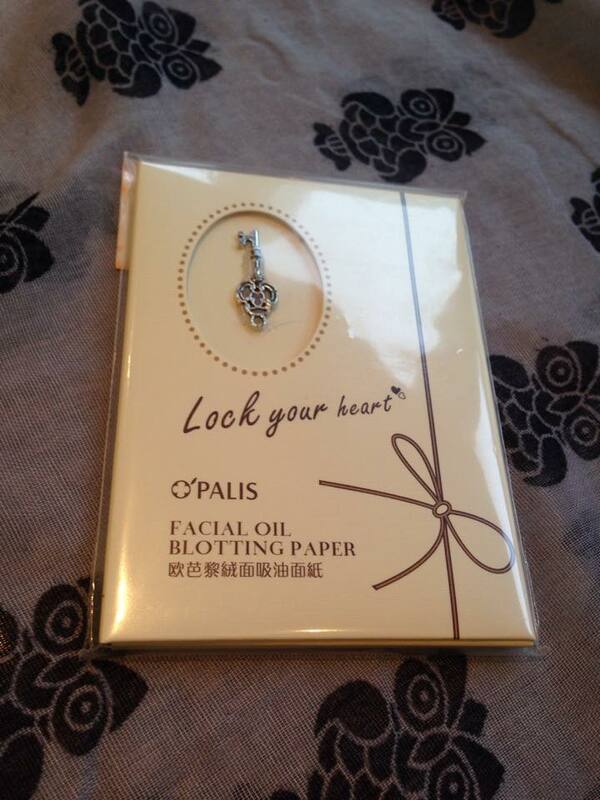 What was quite interesting though was that this was not an ordinary sheet mask, but one for the chin! I haven’t got a chin mask in my collection so this is a nice addition. It’s made with collagen and centella asiatica aka Asian/Indian pennywort which is used in traditional Chinese medicine. 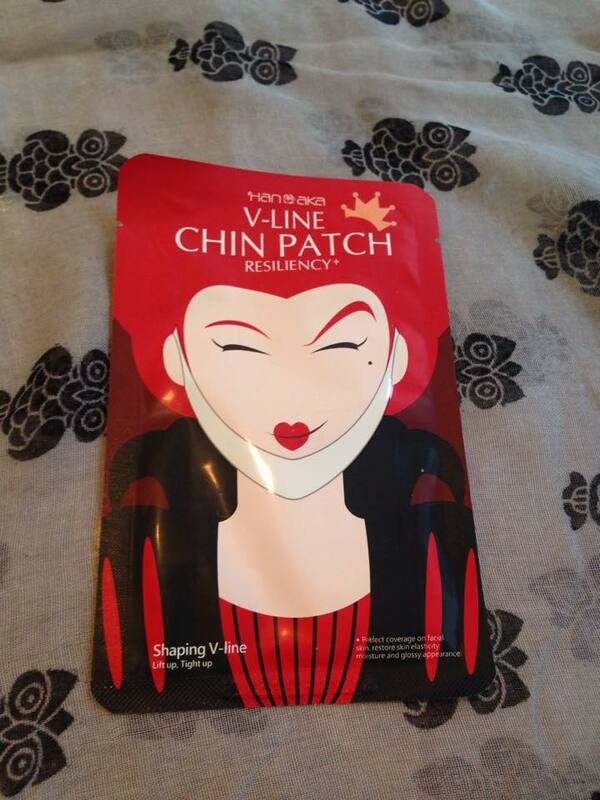 Now I don’t actually believe it will have a lasting effect on the firmness of my chin skin, but it will be fun to try. 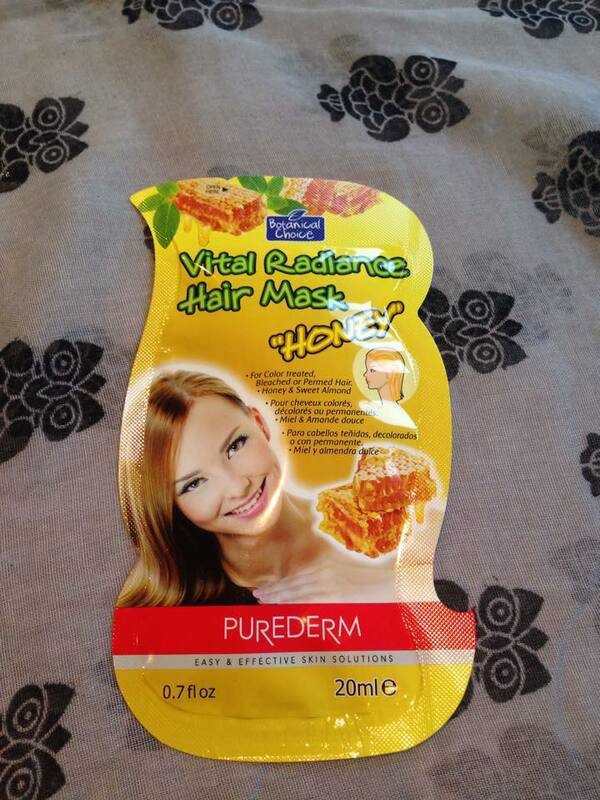 I got the Honey mask which I for permed or coloured hair, and this is one of the styles may vary items. The other two were Chamomile or Jojoba Oil. I really wish I had gotten one of the other two types. As it is I don’t have bleached hair, though I did perm my hair almost a year ago now, so it might help… This is not something new, it’s been around since 2012, I kinda wish they had added a more recent or interesting product instead of this. 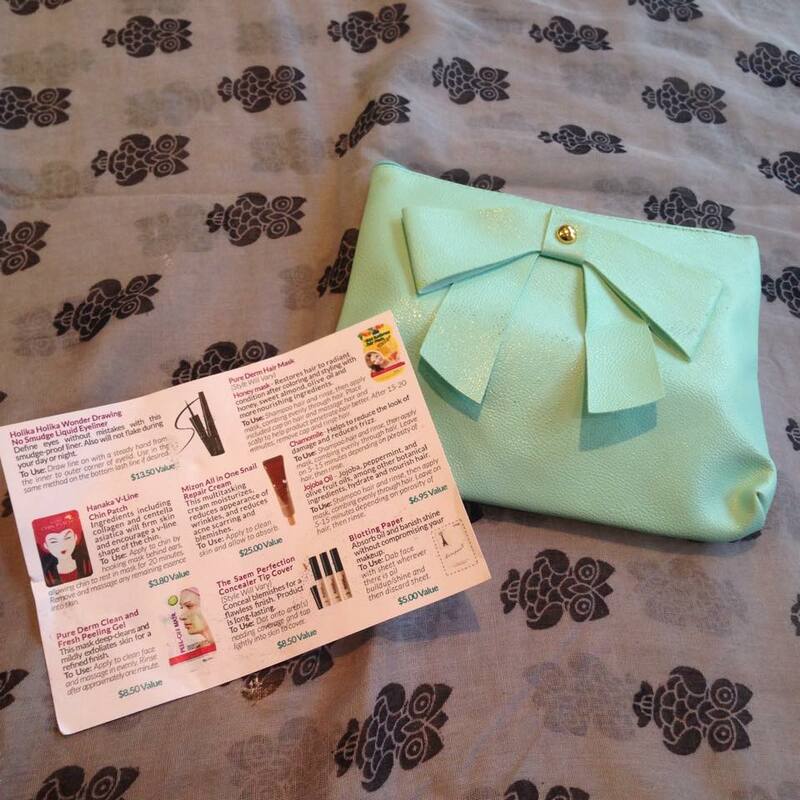 Beauteque include a lifestyle item in each bag, and this blotting paper was this months. Yes this is useful. But Jolse includes blotting paper as a free sample frequently when you order with them. This is a large size, which is usually a good thing, but with blotting paper I prefer mine more compact so I can discretely keep it in my bag. This was a major disappointment to me, almost as bad as the time they included a cheap looking razor (April Review here). 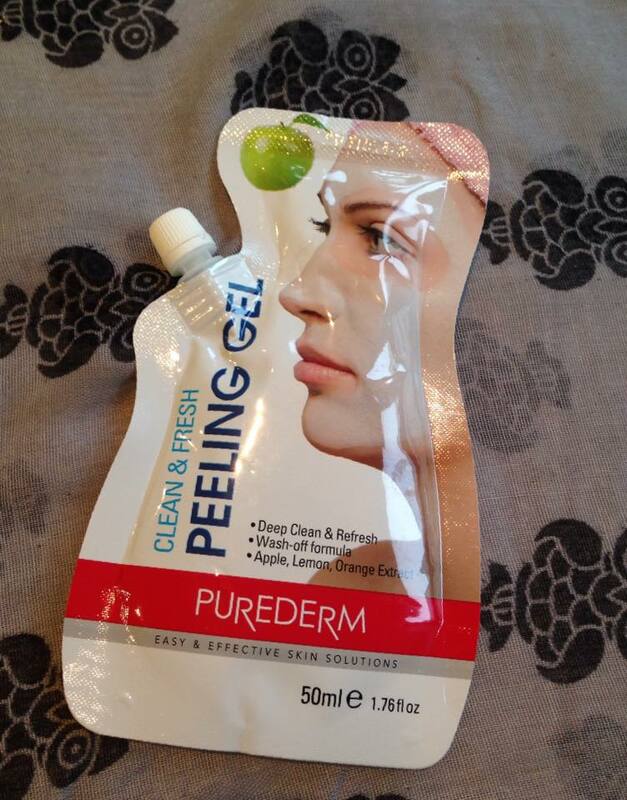 This is a deep cleansing peeling mask and I love the packaging it’s like a juice box! Peeling masks are great for exfoliation and I haven’t tried many before so I’m looking forward to giving this a go. Finally some real positives! 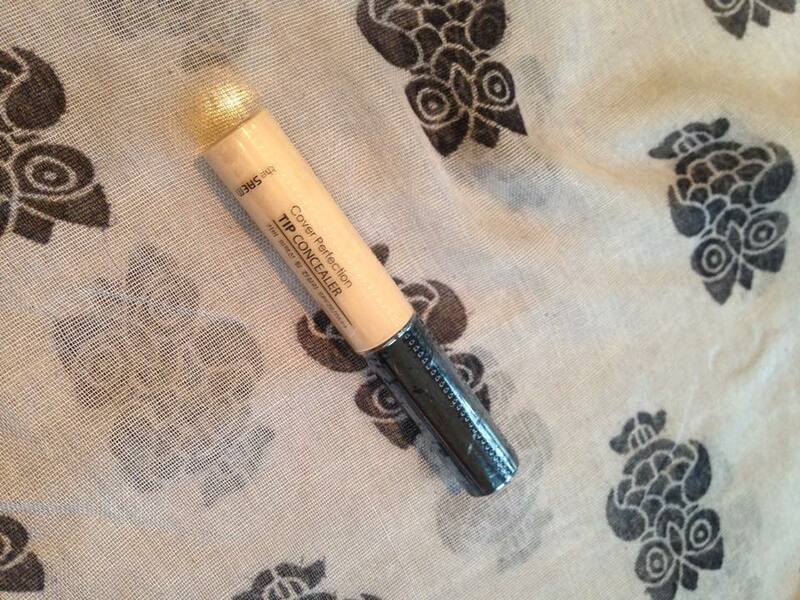 This is a pretty decent concealer, and has a brush tip which made for easy application. I felt that the product was creamy and felt light on my skin. This is a pretty popular product, and has got great reviews online. Other people have used this as a brightener/highlighter as well. The downside is that with something like a concealer is that it is usually best to try in store, as it might not match the skin tone. This was an okay match for me, and I do need a concealer so I was happy. Saved the best for last so this could end on a positive note! So YAY SNAIL! YAY MIZON! I have the recovery gel from their snail line already, and the full sized version of this. But it’s a nice travel size version which I appreciate, and I can’t say no to more snail. The reason I’m very happy to see this is that it has a great consistency, is a great moisturiser and is easy to apply. Snail extracts contain lots of skin-friendly proteins and anti-oxidents which is why it’s become a firm Korean skincare favourite. So that was the August Beauteque ‘Treasure Chest’. You can probably tell by now but I was pretty disappointed by this month’s bag. The value of the bag was less than what I paid as well, by my own internet searching (though this doesn’t include shipping, I also wouldn’t buy some of these items so I think it evens out). 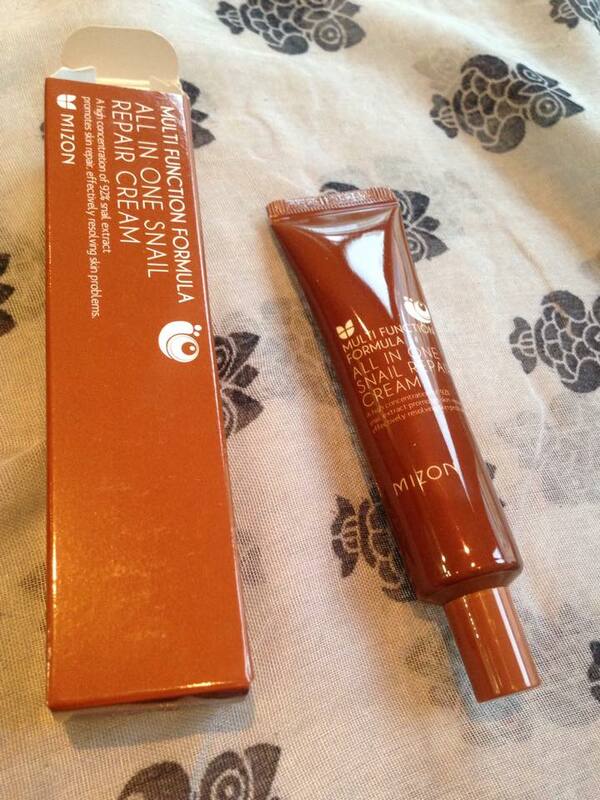 There weren’t any standout items apart from the Mizon cream which I already have. What was nice was the mix of skincare, hair care and beauty items. Now hopefully they keep that mix up but have different products!